2017 was blur…great projects and clients, a growing business, and some amazing travel. One of the highlights was the debut of my powder room at the San Francisco Decorator Showcase House. A small, windowless room, the smallest room in the house. Low ceilings, and no architectural details to salvage, this was not much more than a closet when I started. The challenge was to make this enclosed space feel larger. Inspiration came from a simple Roman fountain, with execution and detailing influence from trips to Rome and Milan. 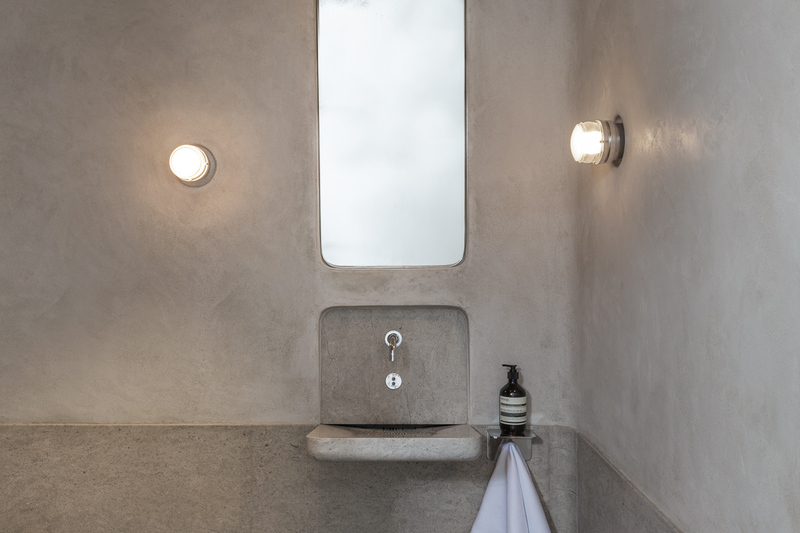 The result is a self-contained, immersive space that is quiet, reflective, and exquisite…in a way the anti-jewel box powder room. Like many of my projects, the design focused on the confident handling of materials, the detailing of which are revealed in the soft light animating the space. Trick the senses. The rounding of all inside corners not only highlights the thickness of the materials, but also results in a lack of shadows. Our peripheral vision, lacking the vertical shadow lines that define space, is tricked into perceiving the space as bigger. I like this about the work of James Turrell, using light-spaces to immerse the senses. The effect is most visible from this perspective: rounded corners visible against the wood flor, with eased casing around the door and softened-underside of the sink. Blurring boundaries. An ombre mirror, set at an angle into the wall, slowly fades to wall color, making the two blend together. 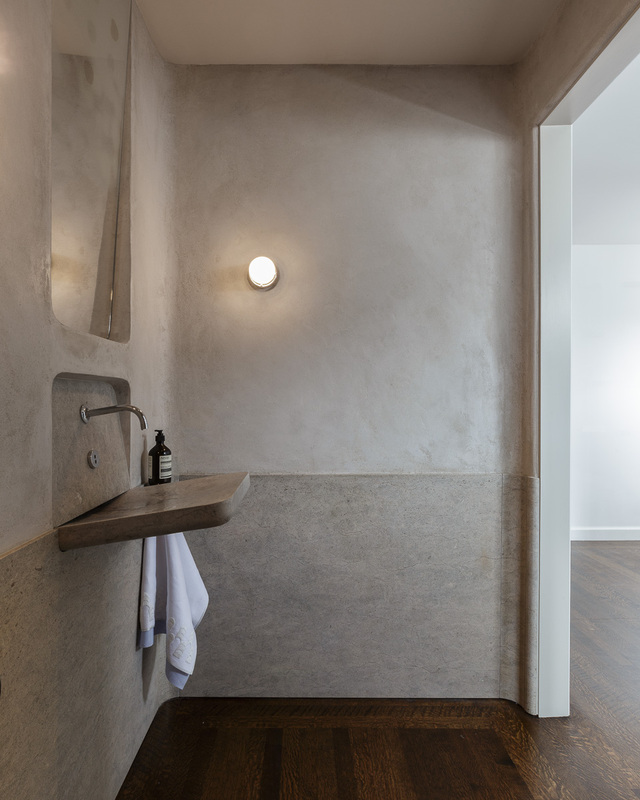 Setting the mirror into the wall reveals the depth of materiality, and the angle catches the sunlight from the hallway window and directs it down into the room. I’ve noticed this effect of light often in Europe, where detailing of windows is more complex and effective. A custom soap holder by Metropolis Metal Works and embroidered towel by Malatesta and Co. compliment the architectural detailing. Monochrome. A color palette of shades/hues also tricks the eye into perceiving a space as larger. 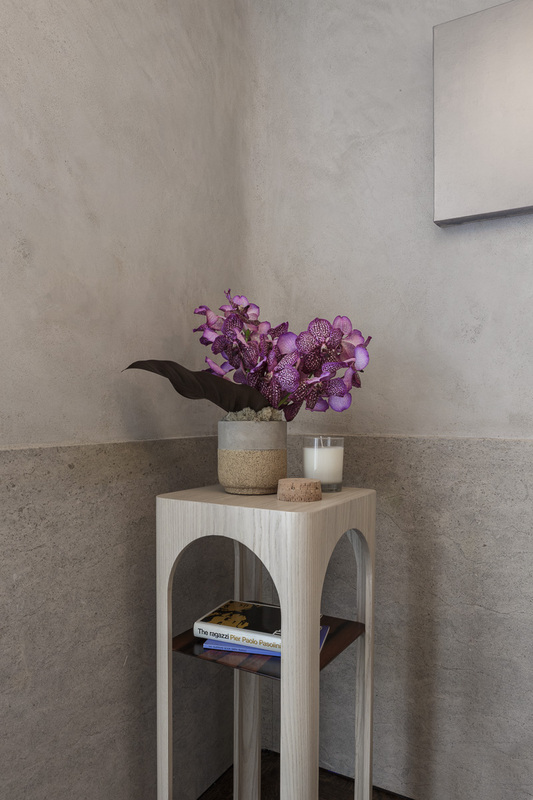 Texture adds depth in both the plaster and limestone wainscot. Joe Colombo lights are the “jewelry” in this powder room. Detailing. Subtle detailing of the sink, wainscot, mirror and sconces accentuates the uniqueness of each object, bringing all into focus. 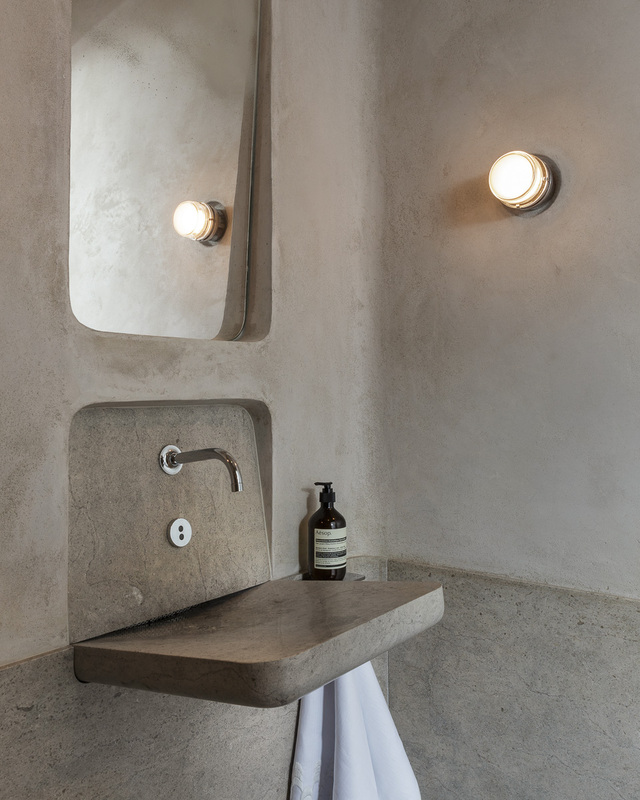 And insetting the sink allowed us to gain 6 or 8” of space in depth, creating a sense of a roman fountain in a renaissance square. 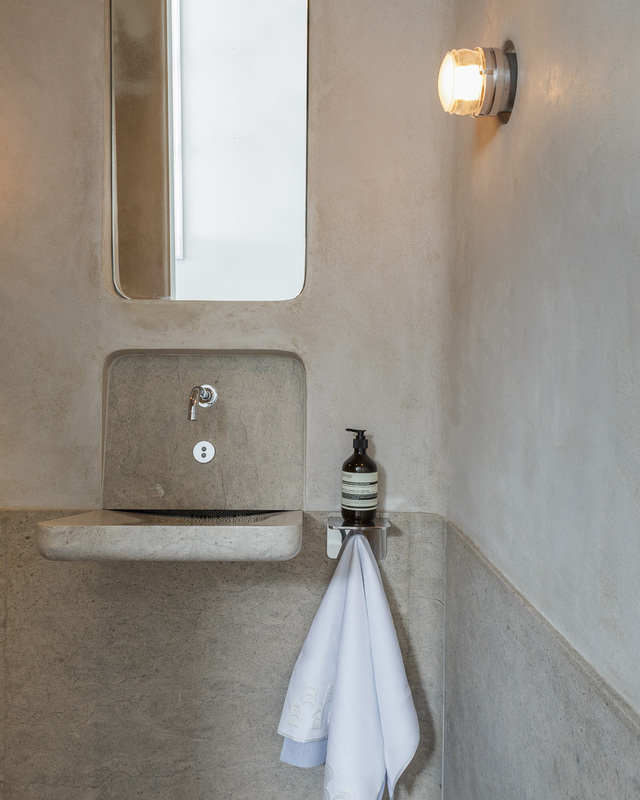 Setting the toilet at angle, both creates a more sculptural moment but also allows extra room for the side table. A beautiful David Simpson painting softly radiates, creating an artful corner in this bathroom. I also love the challenge of creating a restrained book and sculpture stand that set back in the space, while referencing Italian design. I called this my Inside-Out table, as I flipped expectations: the precious, waxed and polished Rosewood shelf is tucked in the interior, and simple, lightly finished Ash (often used on the interior of fancy furniture) features prominently on the exterior. Inspiration. I was inspired by the films, architecture and design of Rome and Milan, and the simple roman fountain. My influences come from history, travel, and technical innovation, and the joy comes from the mix/match to create a unique, uniform whole. 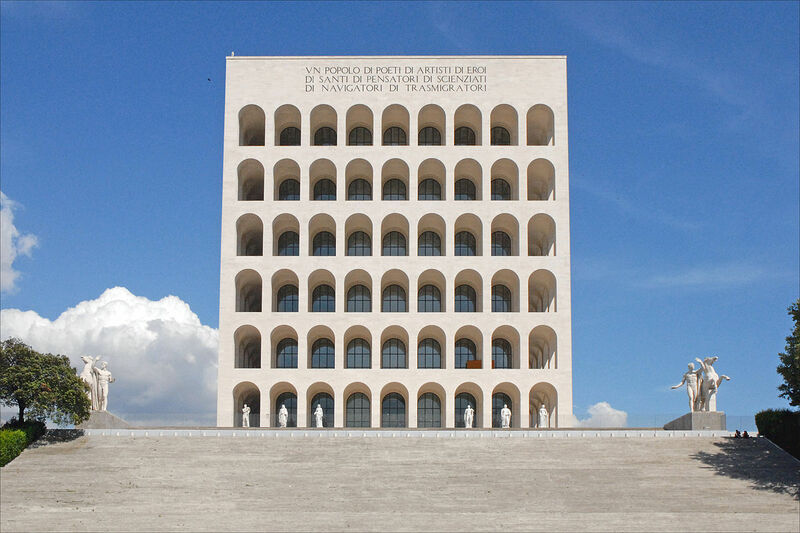 The Palazzo della Civiltà Italiana in Rome is a constant source of inspiration. 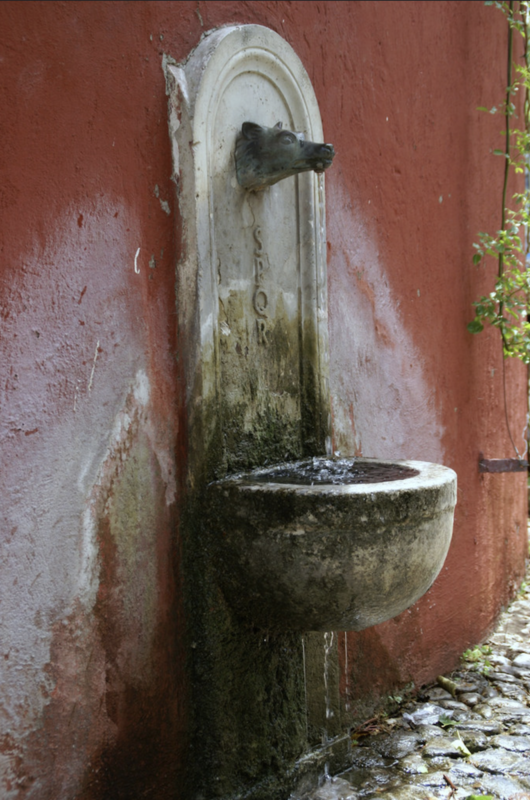 A typical roman fountain: simple, and cantilevered from a wall, with impeccable details. A special thanks to my collaborators: Stephen Stout, Mattarozzi Pelsinger, Haussman Natural Stone, Metropolis Metal Works, Terra Briosa Plaster, Rossi Antiques, and Malatesta and Company. Thanks for the kind words Dave! This was a fun project indeed, and great way to kick off starting my own firm.